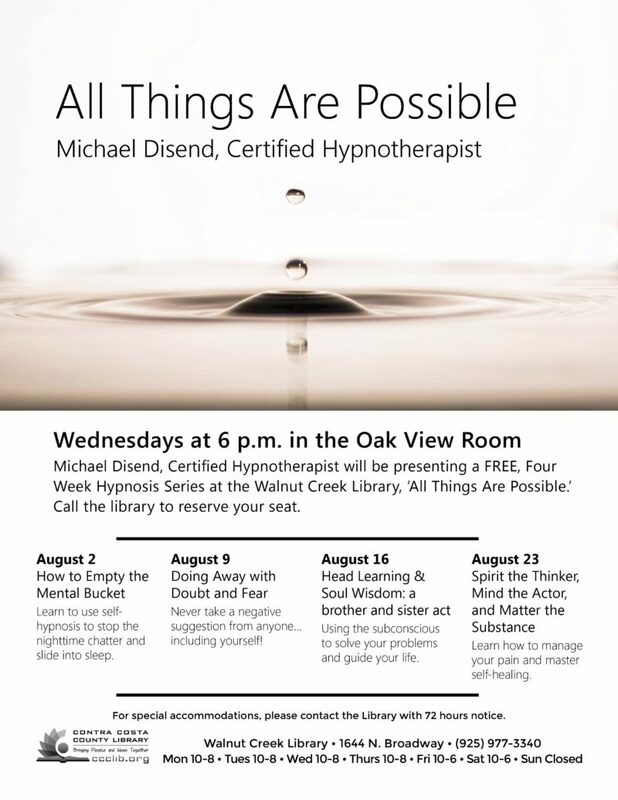 Join Michael Disend for the seminars running through August in our 4 week Hypnosis series with Michael Disend, Certified Hypnotherapist, at the Walnut Creek branch of the Contra Costa County Library: 6 – 7:45 pm, Wednesday August 2, 9, 16 and 23, 2017. On Thursday, January 21st 2016, Michael Disend will give a workshop at the Jewish Community Center of San Francisco (JCCSF), teaching strategies for quick and lasting self-improvement and quality of life. Michael will explore ways to conceive, believe and achieve your success goals. Learn practical skills applicable for every realm, from wellness to love to business. Learn how to release emotional blockages and thrive in the inner and outer world of your own creative thought. The private and peaceful room in Walnut Creek is also approximately a 5 minute walk from BART. Contact Michael Disend for a free consultation: (415) 440-8767, or . Why don’t we see that the end of suffering is realizing we’re already free? Why do we often perceive loving surrender as a doomsday scenario? Why is sitting in peaceful silence reckoned to be a rough, jagged, bumpy road to hell? The healing effects of His Love are herenow. Body is essentially nothingness, not a god. World is whirling nothingness, not a deity. Pain and fear and hate and attack and sin are confused illusions. Thy Will for you is perfect happiness. Good, Gooder, Goodest is what the beloved Voice wants you to hear. Pure joy and beauty. Pure peace. Pure healing. Tim Vantress of Equal Time explores the power of hypnosis. From weight loss to smoking cessation, hypnotherapists provide help to their clients. Bay Area hypnotherapists Rose Stein, Stephen Massaro, Dorothy Tyo, Michael Disend, and their clients are featured.